With a magnificently plush dining room, Podium Restaurant presents fine British cuisine, created with sublime local produce. With a magnificently plush dining room, Podium Restaurant presents fine British cuisine, created with sublime local produce. The chic Podium lounge and bar is the perfect spot for a glamorous cocktail or glass of wine. Crafting British delicacies with beautiful presentation, the Podium menu emphasises robust flavours, and use of the finest seasonal produce. Signature dishes include walnut and maple roasted duck breast with raspberry and elderflower jam, or succulent spiced monkfish with Bombay potatoes. 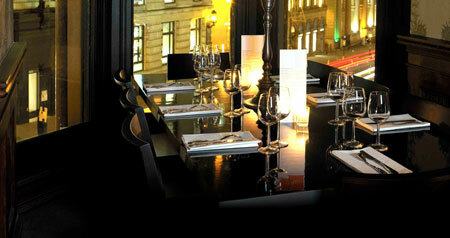 The sophisticated dining room at Podium features crisply dressed tables and plush black furnishings. For a sophisticated selection of drinks, Podium Manchester boasts an extensive wine list to complement the perfectly crafted dishes. Found at the Hilton Manchester Deansgate hotel, Podium Restaurant, Bar and Lounge offers sumptuous British dining in a sleek setting.